In this menu issue you get an insight into the production works of the Elios Schastél film productions Ltd. The movie perspectives of the paradise conveys the artistic conception of our company. The conveyance of esoterism like for example the cosmos and the paradise is realized in a dramatical way with the help of artistic performances. The media of these performances are movements and choreographies, music and voice, image, light and costume. 22 artistic performances of cosmic and paradisiac kinds of beings were made in Italy and Switzerland. The cosmos, eighth paradise, the German deity, archaryan race, light child of god, mother of god, extraterrestial, the Egyptian deity, the Egyptian deity & her pain, diamond, consciousness, Shasa, bird of paradise, above being, Schastél in the context of the element water, Schastél in the context of the element earth, sun, Eve, the struggle between air & fire/ a Gemini and a Sagittarius, Universales/ queen of the universe, eternal rise and the Tumo are dramatically made to an artistic overall work. From numerous perspectives the cosmos and the paradise are interpreted. Click the movie to order! 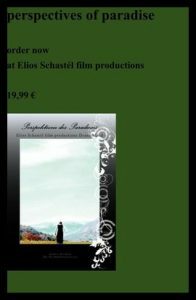 All contents of this website are made by Elios Schastél film productions.